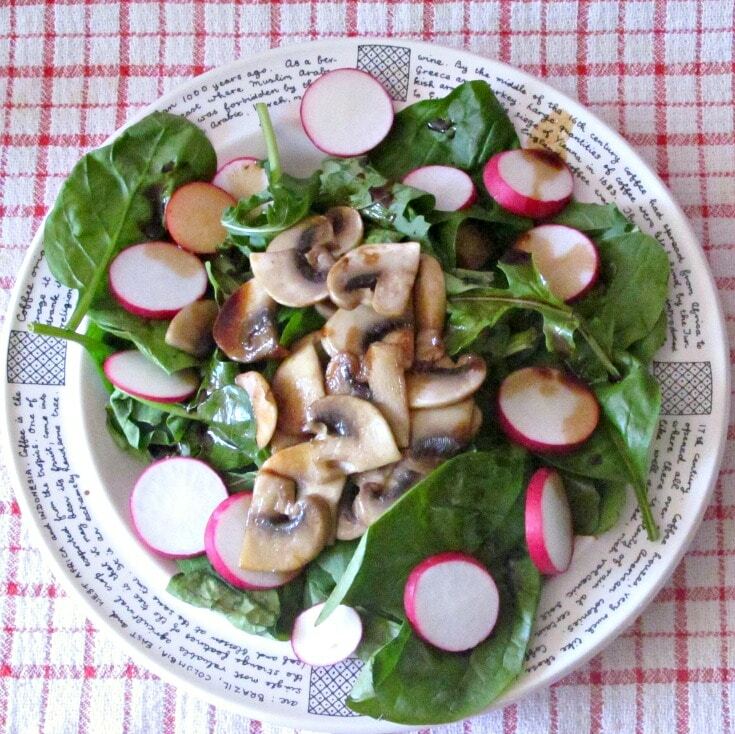 Use tender spinach and other spring greens in a Wilted Spinach Mushroom Salad and enjoy the contrasts of temperature, as well as texture and flavor! 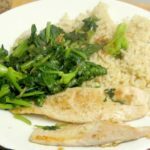 You wilt spinach or other tender greens by parboiling, steaming, or otherwise cooking them very lightly, so that they’re not really cooked, but are a bit soft. If you want a salad, you do this by adding hot ingredients and, specifically, a very hot dressing and tossing that with the tender greens. The heat of the dressing lightly cooks the leaves it touches, leaving others crisp, for a lovely range of texture. We’re a bit loopy about mushrooms, as are most of our friends, so for us, this was a quantity of mushrooms that serves two very nicely indeed. It could actually make a perfectly good salad for four people with more, er, moderate tastes… And of course it scales up quite nicely. Prepare your greens first. Spinach, obviously… the younger and more tender the better. I added arugula, and very much enjoyed the slight bitterness in contrast to the mushrooms. If you have some tender baby bibb lettuce that should work, though it has less flavor than the others – I wouldn’t use anything really crisp. We want tender and flavorful, here. Then, really just as garnish, I added a few thinly sliced radishes. Spring onions would have been delightful. Just a little of these other flavors, though – an accent, not the primary note. I did not add these, but another option… Hard cooked eggs are entirely traditional here. It makes a slightly heavier dish, of course, but it would be a wonderful way to round out, say, a bean soup. Prepare your salad ingredients, arrange them on plates, and set aside. Now, I like to cook the mushrooms here until they are tender, but not as soft and browned as I would for, say, a spaghetti sauce. This is a salad, after all… So cook them a few minutes, to your own taste, then use a slotted spoon to lift the mushrooms out of the pan leaving any oil, juices, and browned bits behind. Arrange them nicely over the greens on your salad plates. Spoon the vinegar reduction (fancy terms, no?) over the salads, and serve at once. Now, for that dinner party… Wash and toss your greens in advance, cook the mushrooms and hold in the pan… A few minutes before serving, reheat the mushrooms, and arrange the greens on salad plates (sorry – this one doesn’t work well Family Style.) Add the hot mushrooms to the plates, deglaze the pan, spoon the dressing over the salads and serve to your waiting guests – make sure they’re already at the table, this one doesn’t hold well, once assembled. Sit down yourself, and accept their admiration graciously – you don’t have to tell them it is easier than it looks! Prepare spinach and other desired salad greens (arugula, spring onions, etc.) Arrange salad on individual plates and set aside. Wash and slice mushrooms. 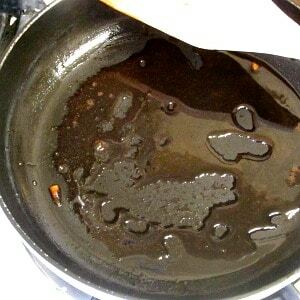 Heat a fry pan, add oil, and half the butter. Add the mushrooms, stir to coat with the oil and butter, and saute until lightly cooked. 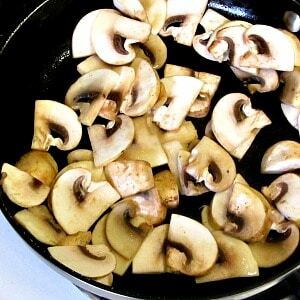 Remove mushrooms from the pan with a slotted spoon, leaving any dripping in the pan, and arrange attractively on the salad plates. Add the rest of the butter to the pan, and swirl to melt. Add vinegar, and deglaze the pan. Pour this dressing carefully over the salads. 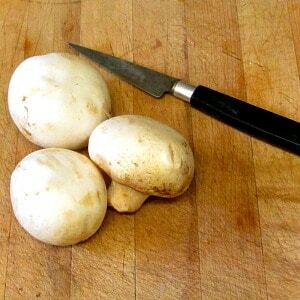 I'm really into mushrooms at the moment, I've never tried them in a salad but I'm tempted to try it out. Oh, you have to! I mean, of course you don't have to, but... if you enjoy them, they're a wonderful addition to a salad, either prepared this way (obviously I'll plug my own recipe LOL) or just sliced raw. Actually, try them both ways - there is a significant difference, and that itself is quite interesting. Did I mention that we really, really like mushrooms? I love spinach! Never do salad with it, I've got to try it this way also, sounds dreamy! A spinach salad is a classic for a reason - it's delicious. Best, I think, with tender young leaves. If you have more mature leaves, you may want to cut out the stems - they can start getting a bit stringy. And you can mix spinach in with other salad greens, if you just want to try the idea, to begin with. In winter, the spinach in the supermarket often has more flavor than the lettuce - if you want wintertime tossed salads, this is one way to improve them. Enjoy it! Summer is salad time. This looks delicious. It would make a great starter salad, or add a bit of protein and turn it into a dinner salad. 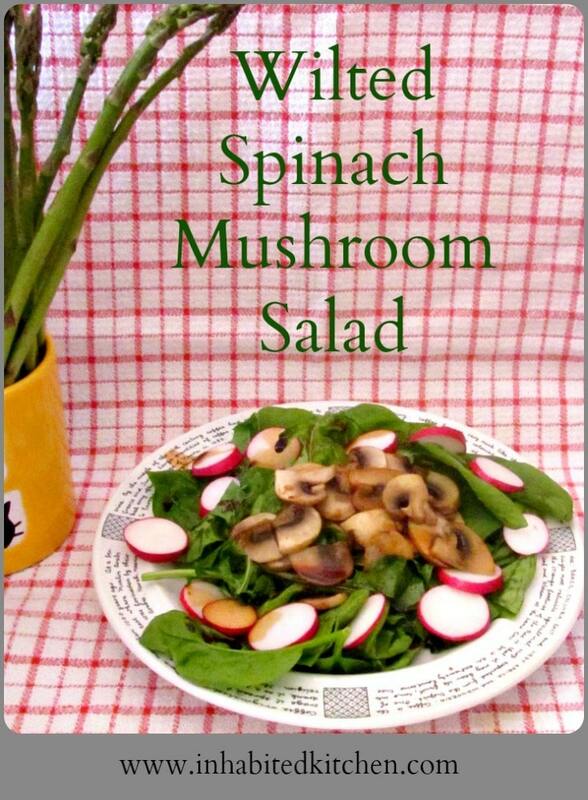 I've had spinach in a salad before but not like this, wilted spinach mushroom looks like an unbeatable combination! Yes, I like it because it's a little different from the usual, as well as being just good in and of itself! Thanks! I love using baby spinach in warm salads too, like you I like to let the heat of other ingredients wilt the leaves a little rather than cooking them directly. Great salad. Isn't that sort of half-cooked texture interesting? Thank you! I love mushrooms!!!!! This looks super yummo!!!!!! Thank you! It really was a delight. I LOVE a wilted spinach salad! This looks incredible! We're trying to eat more salads, I'll have to throw this into the mix. Aren't they good? And it's nice, sometimes, to have have a salad that's a bit different from the typical tossed lettuce... Enjoy it! I just love this salad and how quick and nutritious it is, not to mention delicious, with all those flavours! I love lightly cooked spinach! I love a good warm spinach salad. This is different than the one my mom always makes. I'll have to make it for her! Terrific! I hope she enjoys it as much as we do! I definitely prefer my mushrooms cooked, so this is right up my alley. 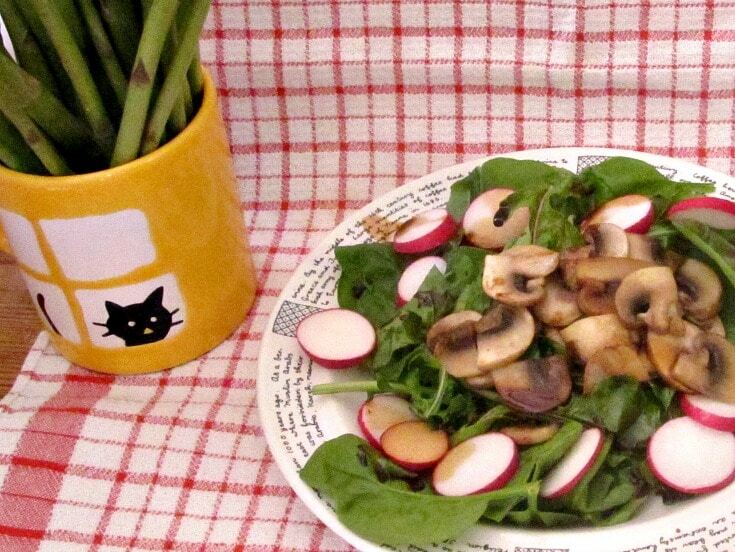 Wonderful time of year for spinach salads! This does hit a nice middle ground between cooked and raw... And we're getting beautiful spinach, now! I love anything with mushrooms! 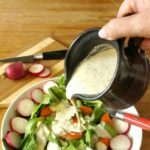 Did you use radishes as well? Yes, they got lumped into "other salad greens" in the recipe... 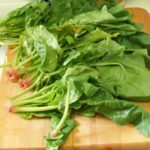 Feature the spinach, certainly, but a little radish, arugula, or scallion to garnish are all pleasant. This is perfect for mushroom lovers!! I'd add some hard-boiled eggs on top too just because I'm addicted to the combo of spinach and hard-boiled eggs! Oh, that's a classic combination! And thanks!